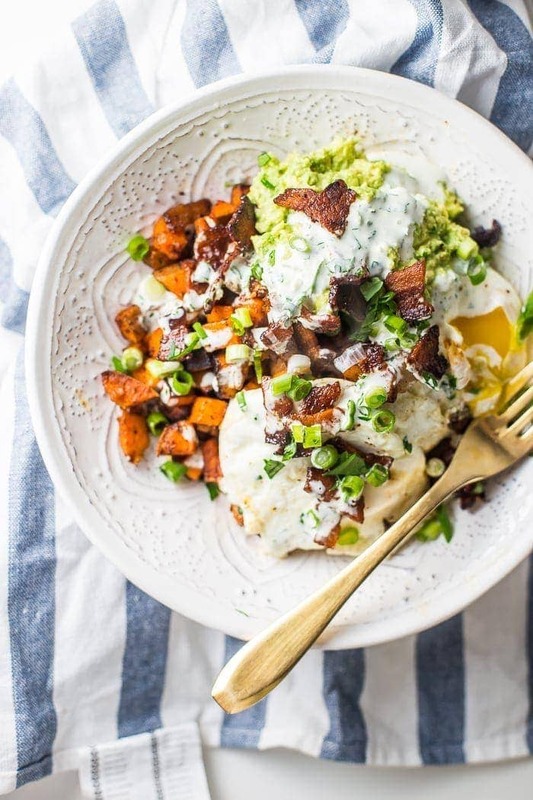 These Whole30 loaded sweet potato fries will surprise you with just how delicious they are. Filling enough for a Whole30 dinner, this recipe is also an excellent Whole30 side dish. 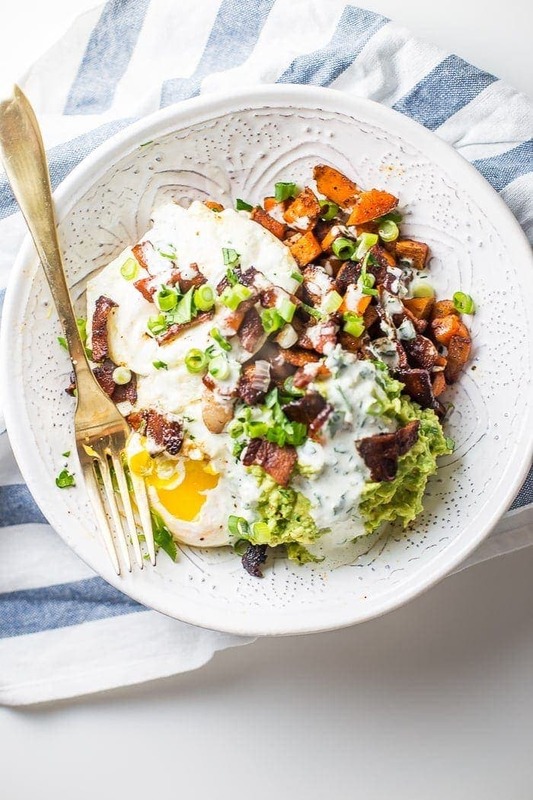 With bacon, fried eggs, guacamole, green onions, and garlicky ranch dressing, you’ll never feel like you’re depriving yourself on a Whole30 with this recipe in your arsenal. 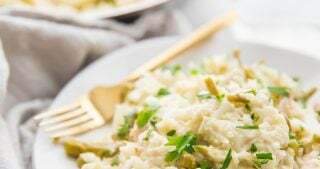 This recipe actually started as a side dish during a non-Whole30 week, when we were trying to eat clean to make up for some recent overindulgence. It started as a sweet potato, unpeeled with a few wiry hairs, sitting solo on my counter. Because, here’s the deal with sweet potato fries: Peel, slice, slice again, soak, drain, towel dry, dust, season, coat, toss, rub, place, bake, turn, swap, pray, remove, notice you baked them one minute too long and are thus black on one side. Am I right? And while we absolutely love sweet potato fries (or, as I call them on a Whole30: baked sweet potato matchsticks ? ), they’re a lot of work. Turning every single fry, hoping that one tray doesn’t overbake while the other tray’s sticks are limp and greasy. They’re worth it when they work, and, let’s face it, they work better with cornstarch and other non-Whole30-approved ingredients, but on a regular basis, I’m a big eh on the sweet potato fry. So I decided on a method of sweet-potato cooking friendlier to my sanity: diced sweet potato home fries cooked in a cast-iron skillet with plenty of spices. I’d serve them with my best Whole30 ranch dressing and… well, wouldn’t bacon be a good idea? And if bacon is a good idea, then you couldn’t go wrong with added a little guac. And if you add a little guac, well, you need a fried egg, of course. And if you have a fried egg, you need green onions. And so I if-you-give-a-mouse-a-cookied myself to these Whole30 loaded sweet potato fries, which, I’m not exaggerating, are the best thing ever. 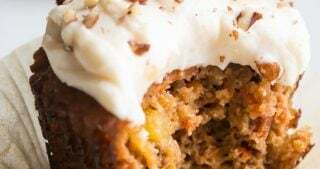 The entire time I was eating them, I was loudly and awkwardly gushing over how insanely delicious they were, claiming them as the best Whole30 recipe I had ever made. 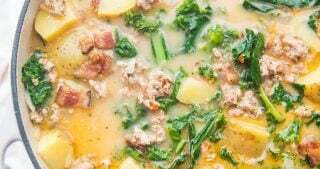 Considering my popular (for good reason) Whole30 zuppa toscana recipe, my Whole30 restaurant-style chicken tikka masala, and my Whole30 shrimp and grits, that’s saying a lot. 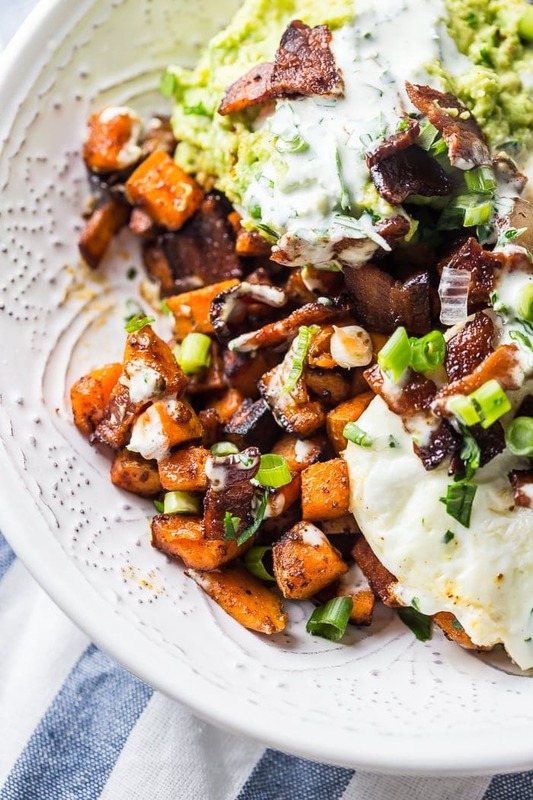 These Whole30 loaded sweet potato fries will surprise you with just how delicious they are. 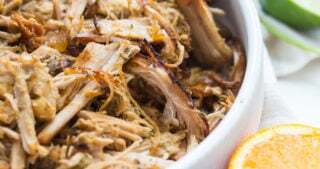 Filling enough for a Whole30 dinner, this recipe is also an excellent Whole30 side dish. 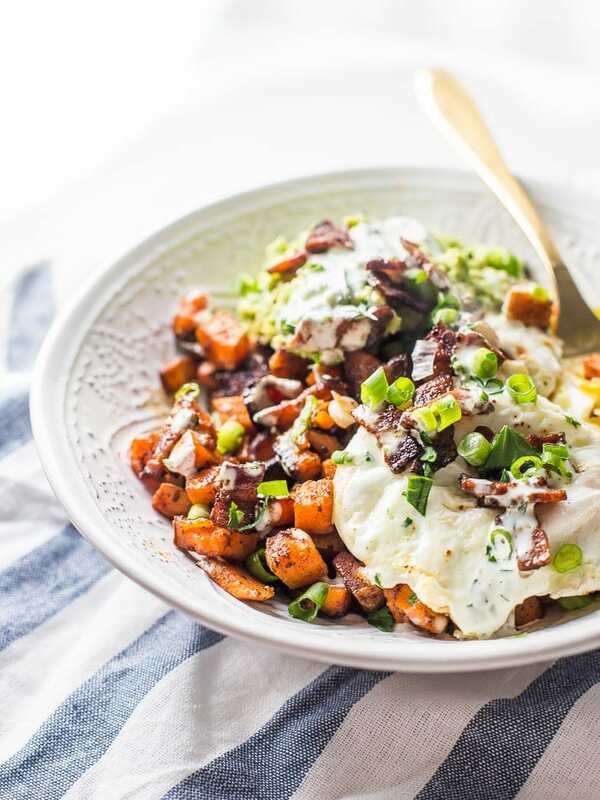 With bacon, fried eggs, guacamole, green onions, and garlicky ranch dressing, you'll never feel like you're depriving yourself on a Whole30 with this recipe in your arsenal. In a small skillet over medium heat, cook the bacon slices until crisp. Remove with a slotted spoon and set aside. Do not drain the grease yet. In a small bowl, combine all spices: garlic powder, onion powder, 1/2 teaspoon salt, paprika, cumin, cinnamon, and chili powder. 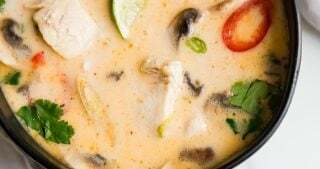 In a large cast-iron skillet over medium heat, melt coconut oil or ghee. Add diced sweet potatoes and cook, stirring regularly, until beginning to soften. Add spices and stir to combine well. Add more coconut oil or ghee if necessary to prevent sticking. Cook until sweet potatoes are easily pierced with a fork. Meanwhile, make guacamole. Mash avocado with lemon or lime juice in a bowl. Add salt to taste. When sweet potatoes are nearly done, fry your eggs. Pour rendered bacon grease into a bowl. Add about 1 tablespoon back to the small skillet and heat over medium heat. Crack 2 eggs into skillet and cook until whites are opaque and beginning to set. Flip, if desired, or simply cook until all of whites are set. Sprinkle with salt and slide off onto a plate. Repeat with two other eggs. Don't overcook - you want the yolks to be soft to help create a sauce. 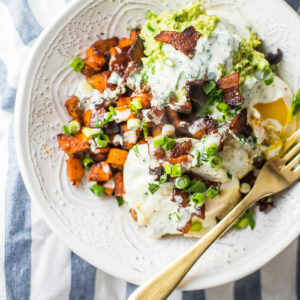 Plate your dish: spoon sweet potato home fries into the bottom of an individual serving bowl and top with eggs, guacamole, bacon, green onions, and ranch dressing. Serve immediately. 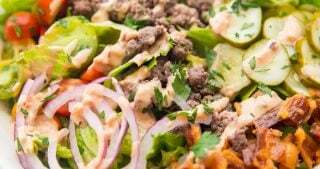 Make my beloved Whole30 dump ranch dressing recipe - click here! YES! I LOVE hearing that! We’re two weeks into Whole30 and just ate this for dinner. It’s TO DIE FOR. I’m planning to make it for my book club this month and I’ll wait until everyone has eaten it before I drop that it’s Whole30 🙂 The ranch is sooooo good. Thanks for sharing!! I wanted to let you know that I just made these for lunch and OMG…..Whole 30 game changer! Thank you for sharing this recipe – I’m looking forward to making your Whole 30 Chicken Tikka Masala this week. I’ve made two of your recipes so far, and this is another winner! 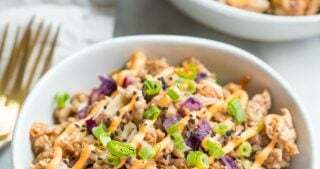 Tastes like “restaurant food” that you crave when you’re on Whole30 and you just don’t feel like going out and asking your server a million questions! Haha. Thanks for the recipe! That’s awesome, I’m so glad, Aileen! Your comment inspired me to make these last night, too 😀 They were so good! 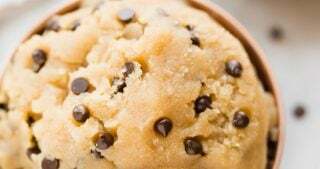 Super easy and delicious. Sixteen year old Son wants more! Silly question.. Can you make this without a cast iron skillet? Is there anything different you have to do? Sure! The only thing that might change is you might have to add a LITTLE more oil, but that’s it! Saw this on Pinterest and made it for dinner tonight – OMG it was SO good! My husband was raving about it and said we def have to make it again soon! I added in black beans, and used Greek yogurt instead of ranch dressing as a topping (not sure if those are Whole 30 approved but we’re not on a specific diet, just looking for some great recipes!). 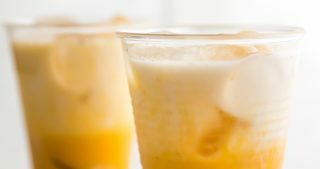 Fantastic job with this recipe! Awesome! I’m so glad you loved it 🙂 Thank you Veronia! Whole 30 or not, this looks SO good. Like “I”m going to eat this for breakfast” good. I’m a sucker for every single ingredient on that there plate. Ranch? Hitting a soft spot. Right? 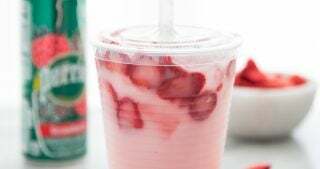 I once went on record saying I thought ranch dressing was underrated. UNDERRATED! You definitely need to eat this for breakfast… and you definitely need to invite me to that. Like, I’ll get mad if you don’t.